CTBaker in the Acres: HAPPY HALLOWEEN!!! 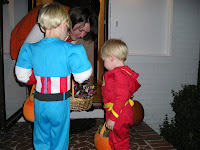 Flash and Captain America wish you a safe and Happy Halloween! 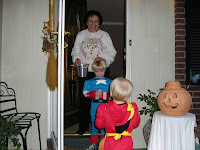 We enjoyed another fabulous Halloween! We started the evening at a great birthday party for our friend, Anne Hamilton. 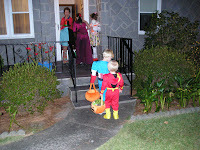 The boys got to wear their costumes to the party so they were already dressed and ready to go when we got home. We headed to a house or two in the neighborhood and then off to Muzzy and Boppa's for the festivities! For those of you who don't know...I get my kookie ghoulish tendencies from my Momma. So we always go over there for Halloween because she does it up right!!! We ate our traditional chili with all the fixins. Got all dootied up and went Trick-or Treating. My Aunt Judy, Aunt Laynie and Cousin Renee joined all of us for the evening. 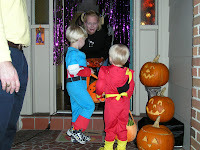 The boys loved all the attention they got over their super-hero costumes with built-in muscles. Shannon and I used to dress up every year...better yet we used to let my mom dress up in whatever she concocted. We've been King Tut and Cleopatra, Minnie Mouse, Mr. Potato Head...all sorts of stuff. This year we decided to join in the fun again. 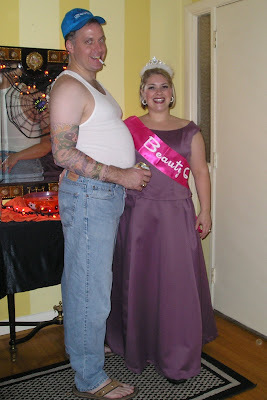 Meet the Red-neck-wife-beating-tattooed man and his trashy-beauty-pageant-common-law wife! I got to experience wearing way too much make up and fake eyelashes, as well as a migraine from wearing a crown all night. Beauty really IS pain! 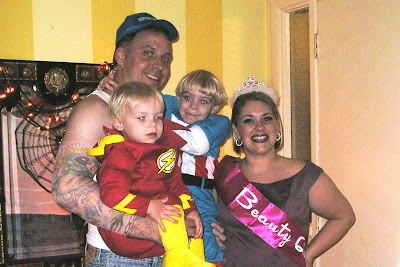 HAPPY HALLOWEEN FROM THE BAKER FAMILY!!! Y'all look awesome! I am so impressed that you two got dressed up:) The boys look adorable as always! Happy 26th Birthday to Clayton!! !